↑ "Homeland Security Secretary Nominee Kirstjen Nielsen Testifies Confirmation". C-SPAN.org. Archived from the original on January 12, 2018. สืบค้นเมื่อ January 11, 2018. ↑ "'That's Not the Kirstjen We Know'". POLITICO Magazine (in อังกฤษ). สืบค้นเมื่อ July 2, 2018. ↑ 3.0 3.1 Williamson, Eric (October 11, 2017). "Kirstjen Nielsen '99 Tapped for Top Post at Homeland Security". University of Virginia School of Law. Archived from the original on January 8, 2018. ↑ "Kirstjen Nielsen: Executive Profile & Biography - Bloomberg". www.bloomberg.com. Bloomberg. สืบค้นเมื่อ June 19, 2018. ↑ Kutner, Max. "Who is Kirstjen Nielsen, Trump's reported pick for Secretary of Homeland Security?". Newsweek.com. Newsweek. Archived from the original on October 12, 2017. สืบค้นเมื่อ October 11, 2017. ↑ Dawsey, Josh; Miroff, Nick (May 25, 2018). "The hostile border between Trump and the head of DHS". Washington Post (in อังกฤษ). ISSN 0190-8286. สืบค้นเมื่อ June 19, 2018. ↑ "DHS Federal Emergency Management Agency". Archived from the original on October 13, 2017. สืบค้นเมื่อ October 12, 2017. ↑ "Kirstjen Nielson". Center for Homeland Security, George Washington University. Archived from the original on September 7, 2017. สืบค้นเมื่อ September 9, 2017. 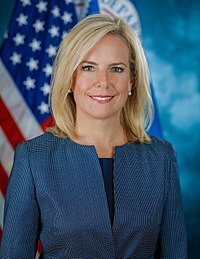 Kirstjen Nielsen is an expert in homeland and national security policy, strategy, and assessment, with a focus in the areas of critical infrastructure protection, including cyber security, preparedness, response and incident management, information sharing, risk assessment, trend analysis and risk management, organizational development, stakeholder requirement analysis, outreach and communication, and training and exercise programs. ↑ 9.0 9.1 "President Donald J. Trump Announces White House Appointments". The White House. September 6, 2017. Archived from the original on September 8, 2017. สืบค้นเมื่อ September 9, 2017. Kirstjen M. Nielsen of Florida will serve as Assistant to the President and Principal Deputy Chief of Staff. Ms. Nielsen formerly served as Chief of Staff of the Department of Homeland Security. ↑ Maggie Haberman, Glenn Thrush (September 8, 2017). "New White House Chief of Staff Has an Enforcer". New York Times. p. A16. Archived from the original on September 10, 2017. สืบค้นเมื่อ September 9, 2017. ↑ "Kelly bringing DHS deputy to the White House". Fox News. July 29, 2017. Archived from the original on September 3, 2017. สืบค้นเมื่อ September 9, 2017. Kirstjen Nielsen, who has served as chief of staff under Kelly at DHS, will follow her boss to the White House, a Trump administration official told Fox News. ↑ Davis, Julie Hirschfeld (October 11, 2017). "White House Aide Is Selected to Run Homeland Security Department". The New York Times (in อังกฤษ). ISSN 0362-4331. Archived from the original on October 11, 2017. สืบค้นเมื่อ October 11, 2017. ↑ Parker, Ashley; Zapotosky, Matt (October 11, 2017). "Trump taps Kirstjen Nielsen to lead Department of Homeland Security". Washington Post (in อังกฤษ). ISSN 0190-8286. Archived from the original on October 11, 2017. สืบค้นเมื่อ October 11, 2017. ↑ Miroff, Nick (December 5, 2017). "Senate confirms Kirstjen Nielsen, a top White House aide, to lead Homeland Security". Washington Post. ISSN 0190-8286. สืบค้นเมื่อ December 6, 2017. 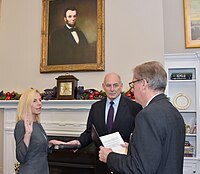 ↑ "Kirstjen M. Nielsen Sworn-in as the Sixth Homeland Security Secretary". Department of Homeland Security. December 6, 2017. Archived from the original on December 6, 2017. สืบค้นเมื่อ December 6, 2017. ↑ Nixon, Ron (December 5, 2017). "Kirstjen Nielsen, White House Aide, Is Confirmed as Homeland Security Secretary". The New York Times (in อังกฤษ). ISSN 0362-4331. Archived from the original on December 5, 2017. สืบค้นเมื่อ December 5, 2017.